For the latest version of this documentation, visit the online version. Be sure to check out the growing collection of Marked 2 tutorial videos. Marked works with Markdown and MultiMarkdown, and can convert syntax from several variants for preview (it can also be extended to work with just about any processor you need, including Textile, reStructuredText, Wikitext and more). I assume that–since you’re here–you at least know what these markup languages are. If not, you should start at John Gruber’s Markdown Basics, check out the TUAW Markdown Primer and brush up on extended syntax with the MultiMarkdown User’s Guide. Marked includes a full Markdown syntax guide under the help menu, so you can brush up as you go. Marked is an editor-agnostic (Multi)Markdown Preview application which watches a file for changes, updating the preview every time you save. By separating and automating the details of formatting it allows you to concentrate more on writing and less on presentation, all while still keeping tabs on your final product. Marked works with any file accessible locally, including iCloud documents. Just drag a text document from any editor’s toolbar to Marked and it will render it as an HTML preview and start tracking changes, updating the preview as you write. It can even compile multi-file documents using a basic “include” syntax, or from Scrivener, Leanpub and mmd_merge index formats. Marked has additional features, including word count and other document statistics, the ability to float above other applications or dim in the background, and it can display your work in a variety of well-crafted styles. It can output to print or PDF, Word documents, complete HTML documents (including styles and images) or copy HTML source or RTF data to your clipboard with a keystroke. Marked also has a basic AppleScript dictionary and a URL scheme which make it easy to integrate into your workflow. Oh yeah, and it works with a ton of your favorite apps: text editors ranging from Vim and Emacs to Sublime Text and TextMate, Markdown editors like MultiMarkdown Composer, Byword, and iA Writer, even apps you might not expect like Ulysses, Scrivener, VoodooPad, MarsEdit, and more. Marked turns any text editor into a Markdown-enabled editor. Your preview is always available and it updates as you work. If your favorite editor doesn’t offer a live Markdown preview, open the document you’re working on in Marked and float the window off to the side for a full-featured Markdown writing experience. Do you like writing or blogging in MacVim or other terminal-based editor? Now you have a synced Markdown preview while you work. Marked also offers display capabilities above and beyond any existing Markdown preview, and can be used instead to provide full word count and document stats, writing suggestions, and even highlight mistakes in your Markdown formatting. You can also use Marked without an editor. 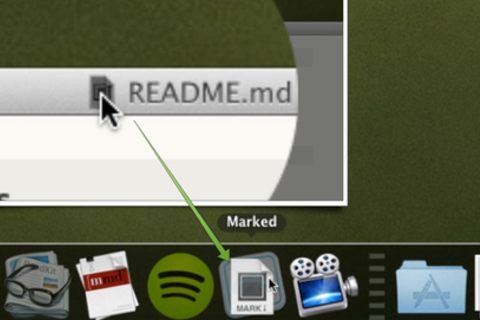 Just drag Markdown files to the icon to preview them, print them and export them to PDF, DOC, RTF or HTML source code. In apps that autosave, you’ll find the preview keeps up with your writing without any help. Use it with any editor… or all of your editors. Writing a book? Marked can compile multiple files for a full preview of your work, and even watch those included files for changes, updating the main document with every save. It can even watch an entire folder for changes, automatically switching the preview to whatever file you’re currently updating.